Langila (New Britain, Papua New Guinea): Volcanic Ash Advisory Center Darwin (VAAC) issued the following report: WEAK VA EMISSION LAST OBS TO FL070 MOV SE AT 22/2320Z. Volcanic Ash Advisory Center Darwin (VAAC) issued the following report: WEAK VA OBS TO FL070 MOV TO SE AT 22/2230Z. A loud and strong explosion occurred Saturday night (22 April 2017) at 22:12 pm local time from the crater. It lasted about 1 minute and launched incandescent fragments over the entire sector of the active crater and onto its walls. 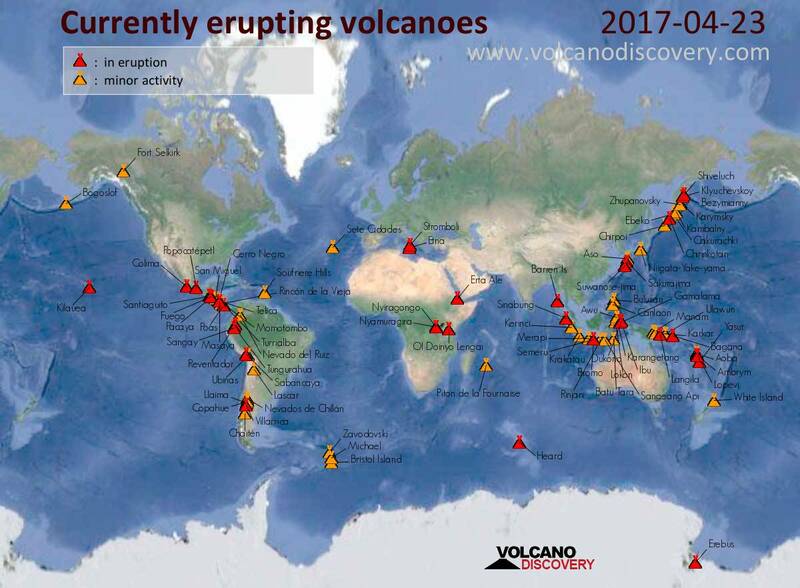 As the eruption occurred at night and only 4 hours ago, not much detail is available, but it seems to have been the strongest in the ongoing crisis so far. The presence of large amounts of incandescent material suggests that the magmatic component involved has increased, i.e. magma continues to rise towards the surface. People in nearby towns such as Alajuela reported strong sulfur smells and ash falls that caused headaches, burning eyes, and respiration irritation.